St. Martin's Griffin, 9780312357443, 288pp. Steven Saylor's Roma Sub Rosa series of novels, set in the later Roman Republic and featuring Gordianus the Finder, has garnered unusual acclaim from readers and reviewers alike, establishing him as one of the pre-eminent historical mystery writers. 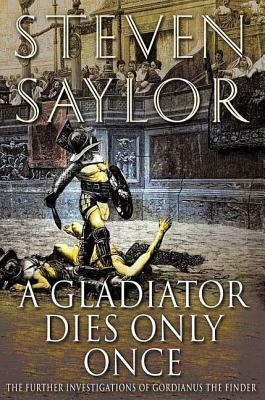 In A Gladiator Dies Only Once, the second collection of his award-winning stories featuring Gordianus, Saylor more than meets his own high standards. Set between the events of his novels Roman Blood and Catilina's Riddle, these previously untold adventures from the early career of Gordianus - when his adopted son, Eco, was still a mute boy and his wife, Bethesda, was but his slave - will delight Saylor's many fans while illuminating details of the ancient world like no other writer can.